Heavenly blog! : No. 1324: Narr Apostel Jan Aage Torp is emerging as a notorious liar - when will he admit his guilt is now the big question? No. 1324: Narr Apostel Jan Aage Torp is emerging as a notorious liar - when will he admit his guilt is now the big question? Narr Apostel Jan Aage Torp is emerging as a notorious liar - when will he admit his guilt is now the big question? Image of liar and manipulator Jan Aage Torp together with Aina Lanton. Joh. e. 8. 43 Why do ye not understand my speech? Because ye can not hear my word. 44 In your father the devil, and you want to do your father's desires He was a murderer from the beginning, and abode not in the truth; for truth is not in him. When he speaks a lie, he speaketh of his own: for he is a liar and the father. 45 But do not believe me because I tell you the truth. There is a pattern with Jan Aage Torp - that he's lying constantly! Therefore, my review he also true and reel! I reviewed him for only one thing, it's false accusations. In other words, it was my preaching against remarriage, which Torp hated and he was revealed by. he found some words I had written that he "thought" was not within its Norwegian law. Police bet on - although in January Aage Torp's goal is only one thing. Get me away and the Heavenly blog from the grid. This as Jan Aage Torp and Manglerud police are doing is basically nothing else than to go against God and his word. What judgment awaits these people I do not dare to name and write! In other words, it is a pretext for this is that Torp is violated etc. when he eg. have gone much further verbal than me. And takes you with his weapon girders Ansgar Braut and Torodd Fuglesteg, so we are moving in a separate category and class! Now lying Torp again that he would not have driven demons out of people here in Norway! He created, inclusive a center of Oslo to engage in exorcism. When Anders Behring Breivik had made his misdeed, which Torp claim that I am a fan, follower and admirer of. When would Torp met him to drive out demons by him, this had HAN GREI ON AND HAD DONE BEFORE! View where Anders Torp will plead with the liar and manipulator Jan Aage Torp, who also claims that his own son lying and speak false, which is not the case. 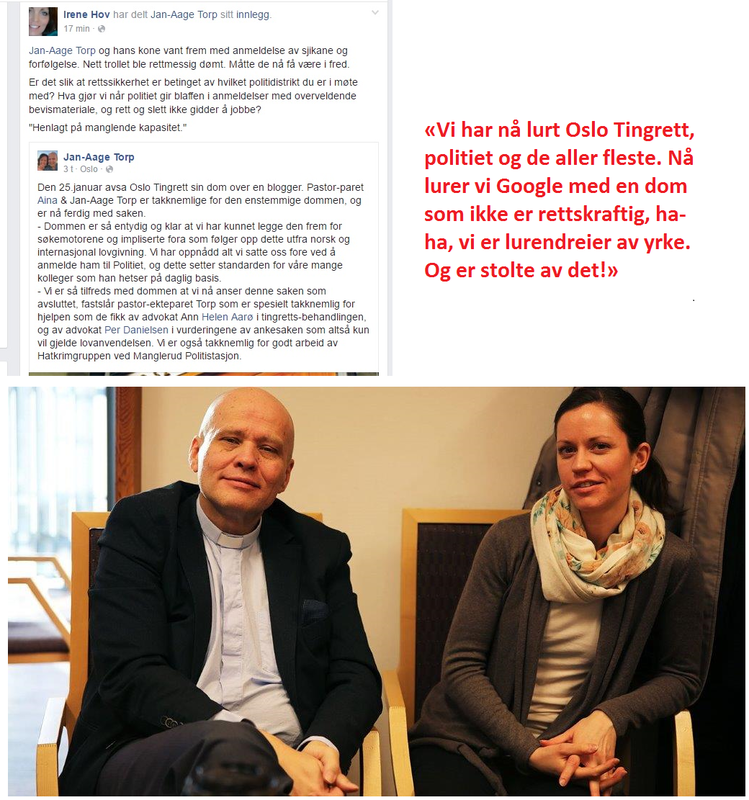 It is none other than January Aage Torp who lie and writes and speaks untrue and lies! When JanAage Torp call me stalker, so he leis! Aina & I have been exposed to a certain personforfølger through the past five years, but now he is sentenced in Norwegian law, and the problems are about to disappear because we brought the matter to the police, and it was well taken care of Oslo The police Hatkrim group. How should one do with all stalkers. The man who is now convicted in Oslo District Court, and the woman who attack my Facebook friend, it bears the hallmarks of stalkers. Hatred and bitterness is blind. My advice to all our friends is: Do not tolerate such stalking. Report them to the police, get them convicted and punished. I have realized during preparations for the treatment of a criminal case that Norway is at least one man who may be called by the English word "Stalker". In the criminal case that the police have initiated against a man who has been doing person harassment, net sake, bullying and defamation of my wife and me through at least 4 years of around 100 others is not the word "Stalker" and "Cyber ​​Talking" used. We are satisfied with the established keywords person harassment, net sake, bullying and libel. But it is useful to link these words to the newer generic terms "Stalker" and "cyber-stalking". This is easy to correct and expose as a lie! Something as Jan Aage Torp is full of. It is that I have never ever in any way. Whether through cell phone when I have not January Aage Torp mobiltelfon numbers even. I never approached him privately when I do not know where he lives. I never approached him some time at a meeting, I do not even know where he's meeting! In other words, all this as Torp fairs about me is nothing else than lies, lies and again lies. The man is obviously full of lies and abode not in the truth! Now he leis about exorcism when many, many can testify that he has both driven and driver and still have the desire to engage in exorcism! Everything with Jan Aage Torp is lies, lies and again lies. 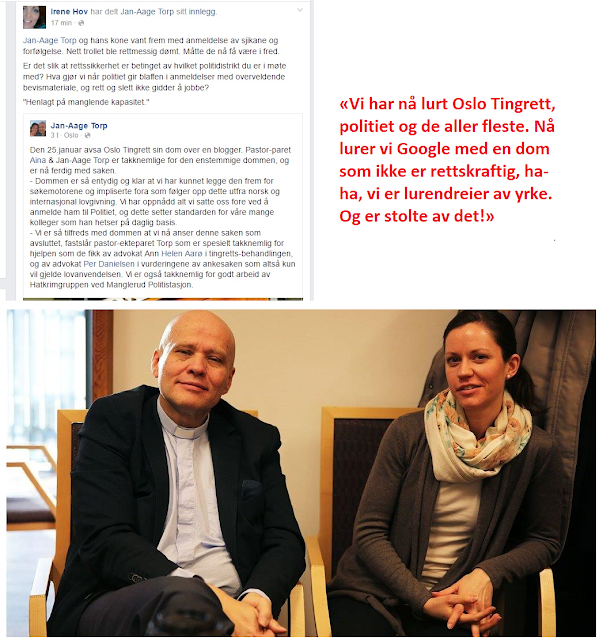 He has managed to manipulate and lute both Oslo police and Oslo District Court, and he lies and raging online. But it's finally good that his son reveal him, though Torp also hates his son Anders and revenge on him with triads posts against him in his own blog. In Anderstorps book is drawn a frightening picture of what he believes happened under the auspices of Oslo Church, and in a debate in the newspaper The day tells Anders that he was only 14 year old boy met an apostle anders-torpedo-posts which commanded intellectual power "fancy "to come out of him in Jesus' name. "There I experienced then and there that I was set free from demons, but the sense of freedom did not last longer than a two week time. Same Apostle also prayed that demons were coming out of my bones, that they prevented me from running fast. On another occasion when he was 15, ran a person named "Otto" out of him the same "light-demon." 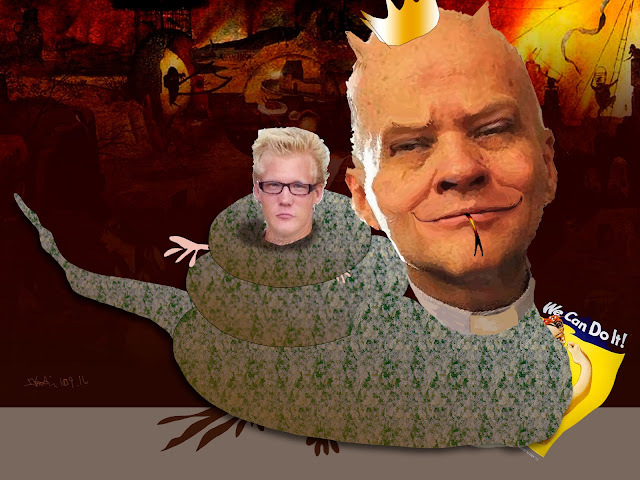 Even as a 13 year old apparently got Anders dealing with exorcism, "- The first time I threw out the demons of a lady was at a conference with Cindy Jacobs, -then that 13 year old," says Anders Torp in his speech. And we quote "- In Zambia I underwent 17 exorcism, and when we came back to Norway waited 10 to. They were performed on me both in Jesus Manifistation camp in 2007 Malmøya, in our home in Yokohama and at premises in Skippergata. On Malmøya camp was even a boy 11 years of age cast demons out of, and also a 13-year-old girl who got PTSD from exorcism in Norway and Zambia. - I would definitely call expulsion Skippergata for a mass expulsion. Mass expulsion followed the same pattern as in Zambia with breathing techniques, and there were several who had severe reactions. As I told the NRK debate on March 17 tried at least one person to escape through the window on the 4th floor, and that two people tried to cut herself with a knife. -Your Version that we stopped this and that help was sought given to those poor girls give poor hold in terms of the "help" they got was expelling satanic blodofringsdemoner by rubbing salt and olive oil into their wounds, and to command demons in Jesus' name. Others had also strong reactions, and I especially remember "Månedemonene" if I remember correctly - that would be thrown out of the Afghan church members - since they had demonic roots back from his time in Islam, "says Anders in his speech.